KOHIMA, JAN 26 (NEPS): Members of Lions Club of Kohima (LCK) led by its President Lion Dr Sashimeren Aier has today visited Kohima Mental Hospital and interacted with the patients, doctors and nurses. 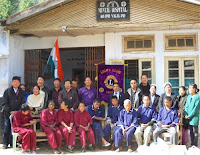 As usual Members of LCK used to visit Leprosy Centers, Mental Hospital, Orphanage Centers, etc in and around State capital, Kohima on occasions like Republic Day or Independence Day Celebrations. And today, the team led by its President Dr Sashimeren Aier visited the Mental Hospital situated here at Aradura Hills today. As a token of love and affection, the Team has given soaps, tooth pastes, detergent items, mineral water bottles, eatable items etc to the Hospital doctors and nurses for the patients. The Team members have personally provided the eatable stuffs to the patients, besides they have moved around seeing from one room to another. Earlier, in a simple program for handing over the items to the patients, LCK President Dr Sashimeren told the patients to be firm in their prayer to Almighty Lord and expressed hope that they would be blessed upon and soon be alright from the ailment. Dr Aier also expressed that the LCK would look into the kitchen problem of the Hospital (Mental) which was shared by the Doctors and Nurses of the hospital.